Ride with speed and power. Make sure that your kite is tuned for unhooking, so that it does not back stall. Keep your kite at 45 degrees and your hands positioned in the middle of the bar. Unhook and keep your elbows bent. Edge hard and leap out off the water, try to throw your feet away from you, behind you and up at the sky. Once you are extending, then you can let your arms stretch out. When you feel yourself coming back pull your legs back underneath you. 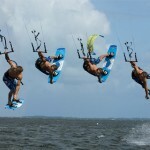 Spot your landing, bend your knees and point your board downwind. Tips! Practice riding unhooked before you try to make unhooked tricks. Trim your kite for unhooking. Come into the trick with speed and power. Edge hard and pop off the water, try to throw your feet back away from you and up towards the sky. Tips! 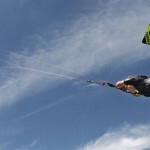 Trim your kite for good line pressure. Adequate line load is key to a good railey. S-Bend – a pretty easy trick, but still impressive! Come into the trick with moderate speed and power like you do for a raley. Have your kite at 45 degrees with your hands in the middle of the bar. Unhook, edge hard and pop of the water. Once you are extended in your raley, tuck your front shoulder and look around your back shoulder. Keep looking until you spot your landing. Bend your knees and absorb the landing. Hook in and ride away, piece of cake! Tips! When you go into the spin bend your front knee to help initiate the rotation. When you start the rotation, “snap” your whole body in the direction of the spin. At first it helps to have your kite higher. Come into the trick with moderate speed and power. Position your kite at 45 with your hands in the middle of the bar. As you go into your S-Bend, start to pull the bar to your back hip. when the bar is at your hip, snap your head in the opposite direction to initiate the spin. Pass the bar from your back hand to your front hand. Once you pass the bar, let your body fall as you spot your landing and ben your knees. Land, hook back in, and ride away cleanly. Tips! Turning your head is the trick! Pull the bar to your hip hard. The more inverted you get the easier the handle pass. A kite surfer will never be satisfied by just surfing up and down the sea. As a beginner you will soon master the technique of going upwind in both directions and you’ll undoubtedly want to develop your skills to be able to make slide turns, ride toeside, be able to make a carving turn heelside to toeside turns without stopping and finally start to JUMP! Once you are able to jump a whole new world is open for you! The number of tricks that one can perform in the air are almost unlimited, in fact it’s only you self that sets the limit. There are hundreds of tricks that already are “invented” but the oppurtunities to create your own tricks are vast! 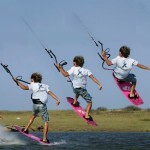 KiteSurfingTrick.com is meant to be a free resource for everyone that wants to learn new kite tricks, get inspiration or to share your own tricks with others. 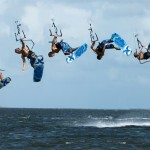 To explain how to perform a trick with just words and a few pictures can be hard so don’t hesitate to ask questions with comment function or help other people to explain how to perform different kite tricks.